Most of us film lovers have one or two films that define what cinema means to them – films that they simply love with a passion and can watch over and over without a single ounce of boredom working its way into our minds. For me, it’s Schindler’s List and Titanic– for others it’s The Godfather or The Wizard of Oz. This unwavering love for certain films is not uncommon, however, not many of us can say they’ve made an entire film inspired by their favorite movie. Well, Director Stuart Birchall can check this accomplishment of his “to-do-list” with his new experimental short film A P E X. Inspired by his love of the Alien franchise, Birchall pieced together a captivating, riveting and all around atmospheric film with a clear nod to the franchise first brought to the big screen in 1979. From the opening title card, which immediately opens in the iconic segmented fade in used in the original Alien film, you are thrown into this world that is very much reminiscent of the classic films, yet completely stands on its own with a modernized facelift. Often times when it comes to experimental films, the lack of a structured storyline can hold a viewer back from being totally enveloped in the experience. This is far from the case with A P E X. The beautiful thing about this film is that, whether or not you grasp the underlying message – this thing is simply fun to watch. Beautiful visuals coupled with stunning sound and music create an artistic experience I’ve rarely seen in short films – especially experimental ones. The A P E X team beautifully meshed together practical effects with visual to create an surreal sense throughout the 4 minute timeline. The film simply screams professionalism – from the creature design, to the lighting, to the editing - all the pieces came together and worked beautifully. Whoever spearheaded bringing this team together deserves immense praise for helping make this film work. Although the entire team did amazing work, one particular team member who I believe needs to be singled out here Danny Marie Elias, who was responsible for the makeup and prosthetics of the creature in the film. Wow. The amount of detail and creativity showcased in the creation was spectacular. Without going into too much detail, the film is worth watching just for the creature alone! Something that was a pleasant surprise when it came to Elias’ work was that he didn’t complacently try to copy or replicate the creature from Alien, yet created his own unique creature which was purely reminiscent of the original. This is true for the film as a whole, which danced a perfect line between showcasing it’s Alien inspiration and creating a unique project. It struck a perfect balance between the two, helping make A P E X an asolute cinematic triumph. 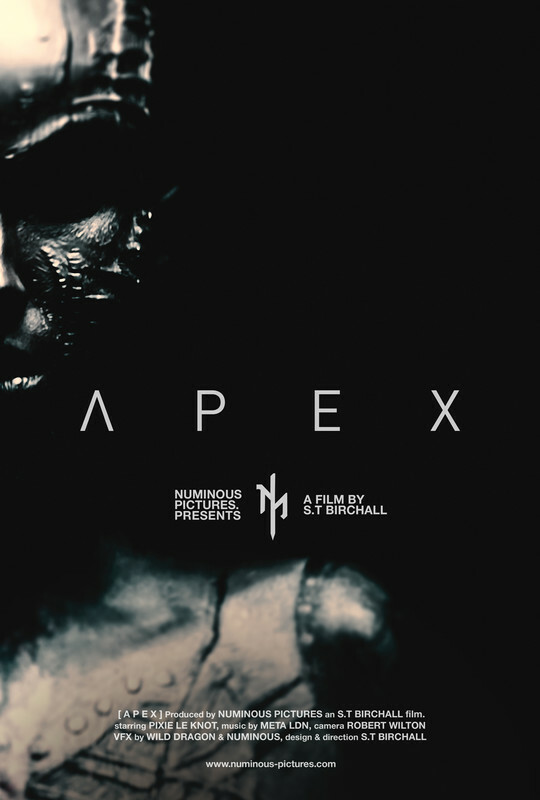 Although inspired by a well known franchise, A P E X is a fantastic standalone experimental film. Easy to watch with amazing visuals and stunning sound to capture the viewers attention, this 4 minute long short is worth multiple watches. Birchall has a clear eye for beautiful imagery and deserves much praise for this fantastic piece of experimental cinema. Well done to the entire team! Definitely a highly recommended watch if you get the chance.